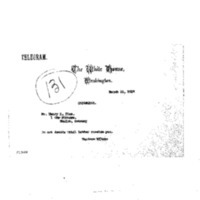 Woodrow Wilson writes to Henry B. Fine asking him to wait to respond until reading letter. Do not decide until letter reaches you. Wilson, Woodrow, 1856-1924, “Woodrow Wilson to Henry B. Fine,” 1913 March 11, WWP17563, First Year Wilson Papers, Woodrow Wilson Presidential Library & Museum, Staunton, Virginia.